Get instant access to exclusive videos, study guides and resources for Smarter Faster Better and The Power of Habit. From the author of the New York Times bestselling phenomenon The Power of Habit comes a fascinating new book that explores the science of productivity, and why, in today’s world, managing how you think—rather than what you think—can transform your life. A young woman drops out of a PhD program and starts playing poker. By training herself to envision contradictory futures, she learns to anticipate her opponents’ missteps—and becomes one of the most successful players in the world. A Marine Corps general, faced with low morale among recruits, reimagines boot camp—and discovers that instilling a “bias toward action” can turn even the most directionless teenagers into self-motivating achievers. The filmmakers behind Disney’s Frozen are nearly out of time and on the brink of catastrophe—until they shake up their team in just the right way, spurring a creative breakthrough that leads to one of the highest-grossing movies of all time. At the core of Smarter Faster Better are eight key concepts—from motivation and goal setting to focus and decision making—that explain why some people and companies get so much done. Drawing on the latest findings in neuroscience, psychology, and behavioral economics—as well as the experiences of CEOs, educational reformers, four-star generals, FBI agents, airplane pilots, and Broadway songwriters—this painstakingly researched book explains that the most productive people, companies, and organizations don’t merely act differently. In The Power of Habit, Pulitzer Prize–winning journalist Charles Duhigg explained why we do what we do. In Smarter Faster Better, he applies the same relentless curiosity, deep reporting, and rich storytelling to explain how we can improve at the things we do. 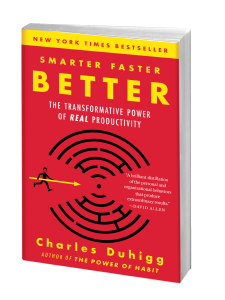 It’s a groundbreaking exploration of the science of productivity, one that can help anyone learn to succeed with less stress and struggle, and to get more done without sacrificing what we care about most—to become smarter, faster, and better at everything we do.